Write your Client Seed on the Smartbridge field. We recommend you to use the generator above to generate a random Client Seed. If you send a blank Smartbridge field, your transaction ID will be used as a Client Seed. Do not send this transaction from an exchange! ARK RequiredNo Ark? No Problem! How To PlayHow Does It Work? To participate in this raffle, you must have ARK in your own wallet, and use the Ark Desktop Wallet version 1.5.1. Exchange wallets aren't supported. Fortunately, acquiring ARK is very easy! The rules are simple: Once you purchase a ticket, it will get randomly assigned to one of the 32 teams competing in the 2018 World Cup, including teams that might already have been eliminated. You can buy as many tickets as you want, each purchase is added to the raffle jackpot. One week after the finals, the accumulated jackpot will be evenly distributed with everyone that was assigned the winning team! Suppose the total jackpot is 10000 ARK, and Brazil won the World Cup. To make the math easier, suppose that 200 tickets were assigned to Brazil: 10000 ARK / 200 Tickets = 50 ARK. This means that, each of the 200 ticket holders will get 50 ARK. To guarantee we don’t manipulate our game, we're running a provably fair system. Therefore the player can check the fairness of every bet and confirm they have not been manipulated. To learn more information about our provably fair system, go to our Provably Fair System tab on the right. Arkland uses a verification system that allows players to check the fairness of every bet and confirm they have not been manipulated. Client Seed is a combination of the Client Seed that you provided, + the 16 first characters of your transaction ID. Server Seed is a secret string that we use to generate random outcomes, and is released at the end of the raffle. To guarantee that we haven't changed this secret, we tell you the hash of this secret phrase. Server Seed Hash is a SHA256 hash of the Server Seed. 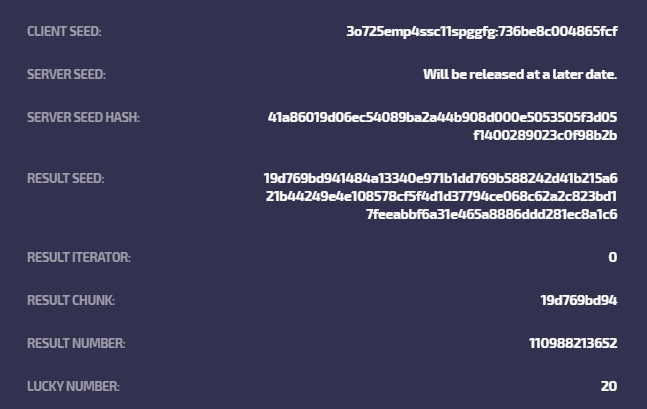 This guarantees that we haven't changed the Server Seed, as once we release it, you can run hash('sha256', $server_seed), and the outcome will be the same as this hash. Result Seed is a SHA512 hash of the Server Seed Hash + Client Seed. We use this hash to draw your Lucky Number. We split your Result Seed into chunks of 10 characters each. Each Iterator is a chunk. In the case of the image above, the iterator is 0, which means the first chunk 19d769bd94 will be used to draw your ticket. If you lucky number is 0, we'll take the next 10 digits chunk of your Result Seed, and perform the calculation with it. In this case, the iterator would be 1.